In this blog article, I explain what zinc anodes are, how they work, and how they benefit your pool when you install them correctly. When you introduce salt into your pool, it converts into chlorine through electrolysis. This process occurs in every pool with a salt system. However, this process can also affect the metal parts of your other pool equipment and speed up the corrosion process. In plain English, salt systems create a more corrosive environment for any metals found in your pool. This can include your pool ladder, steps, heater parts, above ground pool parts, light fixture housings, fittings, and any other metal part exposed to saltwater. Pool owners can use a zinc anode to combat the corrosion of other critical metals in your pool. For example, if you electrically connect an anode to the metal you’re trying to protect, the corrosion caused by the electrolysis will attack the anode first. In a sense, the anode acts as a sacrifice to the more critical metal components. Zinc anodes have a more active voltage than other metals, therefore, it will erode instead of the other metals. There are several types of anodes. For the most part, they differ by means of installation. The best way to determine which anode is best for you is to ask yourself, what specific metals are you trying to protect? Look at your pool’s needs and determine which anode installation makes the most sense. An inline anode is perfect if you are seeking to protect metal parts of your pump, filter, or heater core. Inline anodes mount directly to the metal filter or heater core. However, it does not matter where you place the anode, as long as you install it in the plumbing system to the bonding grid. 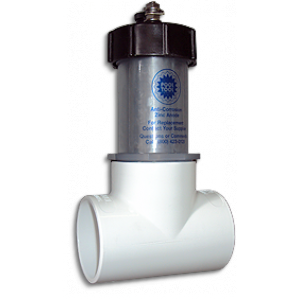 Most inline anodes come in 1.5″ or 2″ plumbing, making it versatile for almost any pool. Additionally, it includes clear PVC construction for easy inspections and also a weatherproof sticker for easy monitoring. The anode weight is perfect for preventing metal erosion or plaster discoloration due to electrolysis. The anode weight keeps the skimmer basket in place. It permanently bolts to the inside or outside of any skimmer basket. This method is one of the easiest and fastest ways to protect your pool equipment. The anode zinc balls work similar to the anode weights. To use, simply place the zinc ball in your skimmer basket. The zinc ball also helps weigh the skimmer basket down into place. Most zinc balls last between two and three years. The anode that works best with above ground pool is the bolt-on type for railing. This type of anode eliminates plaster staining and metal corrosion caused by galvanic corrosion. To install, pool owners permanently bolt the anode to the ladder or grab rail below the water line. This is perfect for saltwater pools. Anodes for pool lighting specifically protect metal or stainless steel lighting. In a poorly maintained pool or pool light that’s been sitting in salt for years, pool owners begin to see black staining around the pool light. The zinc anode for pool lighting prevents this. IT also prevents erosion of the stainless steel light, niche, and discoloration of the chrome faceplate. One of the biggest complaints we see against salt systems is that it destroys the metal parts in your pool. Metal parts such as the face ring on your light, heat exchangers, and ladder treads and rails are most affected. If you are installing a salt system in your pool, we recommend considering a zinc anode. Whenever you introduce salt to metal for a prolonged period of time, you are bound to see corrosion. However, a pool with poor water chemistry is surely to speed up the corrosion process. Combatting corrosion starts with maintaining a balanced swimming pool. However, adding a zinc anode won’t hurt either!